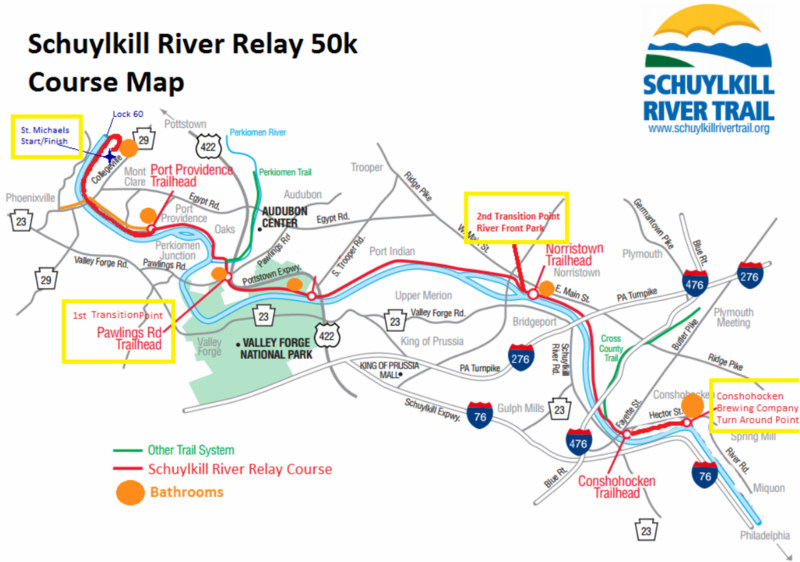 The Schuylkill River Relay is a 50 kilometer race that starts and ends at Saint Michael's Park which adjoins Lock 60 in Mont Clare, Montgomery County, Pennsylvania. Adjacent to Phoenixville. Runners have the option of racing solo, or part of a team of 3 to 6 runners. Runners will follow the Schuylkill River Trail through scenic Montgomery County and the Valley Forge National Park all the way to Conshohocken where they will turn around at the Conshohocken Brewing Company. At the finish line, every runner will enjoy an ice cold Sly Fox SRT Ale. After the race, the party continues. Live music, food trucks and Sly Fox beer will keep you entertained all afternoon. Winning team batons for 1st to 3rd! At the SRT/Perkiomen Trail split follow signs to the left towards Philadelphia, up the hill and across the bridge, handoff is immediately following the bridge. CAUTION when crossing small driveways and roads, they are not marshalled. Cross Bridge and follow bend down to the river and follow the signs for the SRT. Thursday at Sly Fox Phoenixville 6pm-9pm and on Race Day Starting at 8am at St Mikes under the pavilions at the finish line area. Teams are able to pick up for their entire team. please know your bib number and ordered shirt size. Runners will start in waves beginning atTow Path Road near Saint Michael’s Park. Waves start at 9am (based on your self declared finishing estimate that you provided during registration, with those expecting the longer times starting first). All runners will be on course by 10:45 am. Teams will be assigned a start time based on expected completion. Give yourself time to walk from the parking area to the start line. its about 1k away. Look for the 2’x2’ Schuylkill River Relay Banner and follow side trail into trailhead parking lot. Plenty of Parking, Portapot on site. Look for the 2’x2’ Schuylkill River Relay Banner and follow the stairs down to the parking area. This is the Turnaround point for the Relay. Indoor Bathrooms available & beer. Timing team, Relay volunteer will be located next to the Conshohocken Brewing Company Deck and refreshments will be available. Plenty of parking in 500 feet past the front of brewery in the Spring Mill Corporate Complex. Each team and ultra will have a chipped time tri bracelet. Aid stations will be available at each transition point. Race Timing is provided for 8 hours- 9am till 5pm. The race is chip timed. Along the course will be ScoutFoto to capture handoff pictures. At the finish line there will be a staff photographer all afternoon to document your finish line victory and celebratory beers and horseshoes! 1. What is the Course Time Limit? - All runners have 8 hours to complete the course. 2. What if I have 5 members or 2, or 4? - Due to logistics with Timing, we only have registration options of Solo, 3 person and 6 person. So teams of 5 will register for the 6 person team and one person will run two legs. 3. Water Stops? - Because of the nature of the trail and it's limited access, aid stations will only be located at the transition points. Runners must carry water with them for each leg. Water, Bananas, Portapotties etc will be provided at the transition points. 4. How does Pricing work? - Pricing is per team. The team captain will pay for the team and then the teammates will sign up using a special password for no additional cost. So you can charge your team as much as you want! 5. Where are the relay hand offs? - All transitions will be mapped out and sent to teams prior to race day- since the race is an out and back we will have 3 transition points, Pawlings Road Trailhead, River Front Park in Norristown, and Conshocken Brewing Company. Please note, Pawlings Road and River Front park are used in each direction. 6. Transportation? - Teams are required to provide their own transportation to transition points. Points are mentioned above and mapped out on the relay details page. 7. Strollers? - Unfortunately due to the logistics of the race we cannot allow strollers. 8. Is the trail closed to public use? - ABSOLUTELY NOT. This is a public trail, and remains open to the public throughout the duration. 10. Awards - Winning Team Batons. Each runner from the place finishing teams will also be awarded a prized race baton. Place finishing teams will be broken out from 3 or 6 runners into 1st, 2nd and 3rd place for Male, Female and Co-ed Teams. How was Schuylkill River 50k Relay & Ultra?